Background: Alzheimer's disease (AD) is a progressive neurodegenerative disorder of the brain and is the most common form of dementia. There is no known cure for AD, and therefore, alternate therapies are warranted. Multiple reports state that nutritional or dietary interventions may have therapeutic potential and particularly associating high intake of n-3 polyunsaturated fatty acids to reduce risk for AD. In this direction, we have attempted to study the neuroprotective effects of dietary supplementation with canola oil, olive oil and rice bran oil in an aluminum chloride (AlCl3)-induced dementia model in Wistar rats. Materials and Methods: In the present study, spatial memory of AlCl3-treated animals, given supplementation with dietary oils, was evaluated using the Morris water maze. In addition, brain antioxidant parameters, acetylcholinesterase activity and serum biochemical markers were evaluated at the end of the study. Results: All dietary oils used in the present study showed ameliorative effect on the decline in spatial memory due to AlCl3treatment. However, among the three oils, canola oil exerted the most protective effect toward AlCl3-induced neuronal damage by improving spatial memory and brain antioxidant status. Apart from serum glucose, none of the biochemical parameters were altered by AlCl3or by dietary oil supplementation. Conclusion: The study highlights the protective effect of dietary oils rich in unsaturated fats against Alzheimer's dementia. Canola oil showed highest neuroprotective activity against AlCl3-induced dementia in rats. Abbreviation used: AD: Alzheimer's disease; ALA: Alpha-linoleic acid; DHA: Docosahexaenoic acid; PUFA: Polyunsaturated fatty acids; MWM: Morris water maze; AchE: Acetylcholinesterase; UFAW: University Federation for Animal Welfare. Alzheimer's disease (AD) is the most common form of dementia in elderly people and is a progressive disease of the brain that leads to shrinkage of the brain tissue and irreversible loss of neurons. A high intake of omega-3 polyunsaturated fatty acids has been shown to prevent the occurrence of dementia in elderly population. 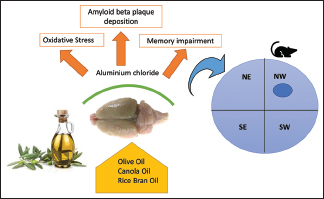 The present study was designed to evaluate the neuroprotective properties of three dietary oils, namely, canola oil, olive oil and rice bran oil in an aluminum chloride (AlCl3)-induced model of dementia in Wistar rats. Wistar rats were administered with dietary oils for 30 days before induction of dementia using AlCl3. Spatial memory was assessed using Morris Water Maze apparatus in treated animals. Brain antioxidant parameters such as catalase, lipid peroxidation and nitrite levels were determined. In addition, the levels of acetylcholinesterase in brain and serum biochemical estimations were carried out. All the oils showed measurable activity in improvement of spatial memory and improved brain antioxidant status present in AlCl3-induced dementia. The study highlights the beneficial effects of three dietary oils on spatial memory in experimental model of AD. Alzheimer's disease (AD) is the most common form of dementia in elderly people and is a progressive disease of the brain that leads to shrunken brain tissue along with irreversible loss of neurons. Its occurrence increases with age, ranging from 1% to 2% at the age of 65 to ≥35% by the age of 85. Alzheimer's dementia is characterized by loss of cognitive functions of the brain that affects day-to-day activities that involve mental faculties such as memory, thinking and behavioral patterns. Despite its increasing prevalence, limited therapeutic approaches for the management of AD are available. Hence, there remains a need to find alternative approaches for decreasing the incidence of AD. Many epidemiological studies show that a high intake of omega-3 (or n-3) polyunsaturated fatty acids (n-3 PUFAs) has proven to be beneficial in patients suffering from mild to moderate form of AD. PUFAs are integral to the functioning of neuronal membranes and for maintenance of membrane fluidity which is key for learning and memory. In diet, alpha-linoleic acid (ALA) is considered the most accessible source for n-3 PUFAs and it serves as a precursor for the synthesis of docosahexaenoic acid (DHA), which is important for normal brain function. Decreased DHA levels are often associated with dementia. In addition, its role in multiple neuroprotective mechanisms such as decrease in accumulation of arachidonic acid metabolites and amyloid beta-plaque formation has been highlighted in earlier reports. Since mammalian systems are not equipped to produce DHA de novo, dietary consumption or synthesis from short chain n-3 PUFAs (such as ALA) are the only source. However, it is known that in the human body, the conversion of ALA to DHA remains restricted and is primarily converted to eicosapentaenoic acid. Therefore, increased intake of fatty fish has been recommended based on epidemiological findings, to provide any protective effect of DHA in the body. On similar lines, increased intake of n-3 fatty acids through dietary oils and increased consumption of fish has been correlated to decreased risk of incidence of AD in clinical studies, substantiating the importance for their adequate dietary intake. In this direction, we have attempted to investigate the neuroprotective effect of dietary supplementation with n-3 fatty acid containing edible oils in male Wistar rats fed on normal pellet diet, in an aluminum chloride (AlCl3)-induced model of dementia. AlCl3 was procured from Loba Chemie Pvt Ltd., India, and olive oil was purchased from Del Monte, Italy. Canola oil and rice bran oil were purchased from dève herbes, New Delhi, India. All other laboratory reagents utilized were of analytical grade. All animal experimental protocols were approved by the Institutional Animal Ethics Committee. Male Wistar rats, weighing 230–300 g and of 70 days old of age, were procured from the Central Animal Research Facility. An acclimatization period of 7 days was given to the animals and temperature was maintained at ambient temperature (23°C ± 2°C) and humidity (50% ± 5%). The animals were kept in groups of two in each cage under the standard light and dark cycles (12 h each), in autoclaved polypropylene cages which had bedding of sterile paddy husk, food, and water provided ad libitum. All animals were fed on normal pellet diet containing standard ingredients such as wheat flour (22%), Bengal gram flour (60%), groundnut flour (10%), skim milk powder (5%), casein (4%), refined oil (4%), salt mixture with starch (4.8%), vitamins, and choline mixture with starch (0.2%) in accordance with Universities Federation for Animal Welfare (UFAW) guidelines. All behavioral experiments were carried out from 10.00 to 16.30 of the day throughout the study in a dark, soundproof, and air-conditioned room. The experimental animals were divided into suitable groups containing 6 animals each [Table 1]. Based on the previous reports on AlCl3-induced dementia models in experimental animals, AlCl3 was freshly prepared in distilled water and administered at the dose of 10 mg/kg i.p. The doses of dietary oils were based on the normal human consumption of fatty acids and were administered at a dose of 3.1 ml/kg p.o. Postacclimatization, the animals were grouped and treatments were assigned [Table 1]. After the completion of the retention trial (day 5), the animals were dosed with dietary oils (day 6 onward). AlCl3 administration was initiated on day 12 and continued up to day 42, concomitantly with dietary oils, maintaining a gap of 30 min between the doses [Figure 1]. Morris water maze (MWM) was used to assess the acquisition and spatial navigation memory of the rats, with a few modifications to the original protocol. The maze was constructed as a circular tank with dimension 150 cm diameter and 40 cm height and was filled with water which was made opaque using a white nontoxic dye and the temperature of water was maintained at 27°C. For the experiment, the water pool was divided into four equal quadrants – Northeast, Southeast, Northwest (NW) (D quadrant), and Southwest, respectively, by two diagonal lines running across the pool center. An escape platform of 10 cm diameter which is submerged 2 cm below the water surface was placed in the NW quadrant (or D-quadrant) during the acquisition trials. To avoid visual clues, the maze was housed in a dimly lit room. The data were collected and analyzed with the help of a video camera placed above the center of the pool linked up to a computerized tracking system AnyMaze software, UGO Basile, Italy. All experimental animals were trained to identify the hidden platform in acquisition trials, consisting of a session of four trials of 1 min each with an intertrial interval of 5 min. At the beginning of each trial, the animal was placed into the pool, facing the wall in the middle point of a quadrant, and allowed to swim for 1 min. If any animal was unable to locate the hidden platform within the trial duration, gentle guidance was provided to the animal, to identify the platform. Once the animal had identified the platform, it remained there for 30 s. In each of the trials, the quadrant was varied so that the quadrant effect is nullified. During the acquisition trials, assessment of parameters such as time to reach the hidden platform (escape latency) and total zone entries was done as an index of acquisition or learning. The escape platform was placed constantly in the NW quadrant (D quadrant) during the 4 days. The rats which were unable to find the escape platform within 20 s on the 4th day were excluded from the study. After the completion of the acquisition trials (on the 5th day), probe trials were initiated and the escape platform was removed. The animal was placed directly across the quadrant in which the platform was placed previously and allowed to swim freely for 60 s before the session ends. Retention trial was repeated on the 42nd day on different groups to assess the memory. A tracking system (automated) (Anymaze by UGO Basile, Italy) recorded and analyzed the path of swimming for each rat and assessed various parameters such as swimming distance, time to reach the target quadrant (NW latency), time to reach the escape area (escape latency), and total time spent in the target quadrant (NW) during the retention trials. The biochemical parameters of the brain, such as oxidative stress and acetylcholinesterase (AchE) activity were estimated in all the animal groups after the completion of behavioral studies. These estimations were done in the frontal cortex and hippocampus. On the last day of the study, that is, 42nd day, the animals were sacrificed by decapitation immediately after the final retention trial. The brain of each rat was immediately removed and the hippocampus and frontal cortex was isolated according to the method described Glowinski and Iverson. Homogenates of tissue samples (10% w/v) were prepared by homogenizing the tissue in ice-cooled 0.1M phosphate buffer pH 7.4 with a Potter–Elvehjem type homogenizer fitted with Teflon plunger at a speed of 8000 rpm. The homogenates were then centrifuged at 15000 rpm at 4°C for 15 min. The supernatant obtained was stored −20°C, which constituted the salt-soluble fractions. Aliquots of supernatants were taken at the time of estimations. Ellman's method was used for estimation of AchE activity using acetylthiocholine iodide as substrate. A reaction mixture is prepared that contains phosphate buffer (2.6 ml, pH 8), followed by addition of 0.4 ml supernatant. Acetylthiocholine iodide (20 μl) and 100 μl of 5,5'-dithio-bis-2-nitrobenzoic acid also known as Ellman's reagent were added after it. The absorbance change was measured over a period of 4 min at 60 s interval at 412 nm using an ultraviolet (UV)-visible spectrophotometer and the change in absorbance per minute was calculated. The final values were expressed as micromoles of acetylthiocholine iodide hydrolyzed per min per mg of protein. A method described by Aebi et al., 1984 was used for the determination of catalase activity. The assay was performed using a UV spectrophotometer, by detecting the change in absorbance caused by the degradation of hydrogen peroxide. The catalase activity was indicated by μmole/min/mg protein. The extent of lipid peroxidation is measured quantitatively by the method given by Konings and Drijver. The assay is based on the detection of malondialdehyde (MDA) levels by the reaction with thiobarbituric acid. The absorbance of the resulting complex was measured at 532 nm and values were expressed as nmol/mg of protein. Nitrite level in the hippocampus and frontal cortex homogenate was estimated with the help of Griess reaction. Briefly, equivalent proportions of sample and Griess reagent were mixed and incubated for 10 min. The absorbance of the resulting mixture was determined at 550 nm. Nitrite levels were calculated using sodium nitrite as standard. Total protein was estimated for all tissue samples using Pierce® BCA Protein Assay Kit as per the experimental protocol given by Thermo Fisher Scientific, USA, using albumin as standard. The blood was withdrawn by retroorbital sinus route into microcentrifuge tubes. The tubes were then centrifuged at 10,000 rpm for 10 min at 20°C to obtain serum. The estimations were performed for serum markers such as cholesterol, triglycerides, high-density lipoprotein (HDL), and glucose were performed as per manufacturer's instructions in kits obtained from Aspen Laboratories Pvt. Ltd., India. The data were analyzed using GraphPad Prism 5.03 software Suite 230, La Jolla, CA 92037, USA. All values were expressed as mean ± standard error of the mean and analyzed using one-way analysis of variance, using Tukey's post hoc test for comparison in between groups. All values having P < 0.05 were considered statistically significant. AlCl3 treatment showed a significant (P < 0.01) increase in the time taken to reach the D quadrant, that is, D latency by the animals. Treatment with all three dietary oils showed a significant (P < 0.01) improvement in the D latency values [Figure 2]a. All animals treated with AlCl3 showed a decrease in the amount of time spent in the D quadrant. However, animals administered with dietary oils showed a marked increase (P < 0.01) in the time spent in the D quadrant. Animals administered with canola oil and rice bran oil spent a greater amount of time in the D quadrant (P < 0.01) as compared to untreated animals as well [Figure 2]b. In the present study, treatment with AlCl3 showed a significant (P < 0.01) increase in the escape latency values as compared to normal animals. Intake of dietary oils in experimental animals also showed statistically significant (P < 0.01) normalization of escape latency values [Figure 2]c.
Neither the administration of AlCl3 nor dietary oils had any significant effect on the body weight of treated animals [Figure 2]d.
AchE activity was increased statistically significantly (P < 0.01) in the hippocampus [Figure 3]b and also increased in the frontal cortex of AlCl3-treated animals [Figure 4]b. Intake of olive oil caused a decrease in AchE activity in the frontal cortex, while it did not cause a marked decrease in AchE activity in the hippocampus. On the other hand, administration of canola oil and rice bran oil did not show any marked improvement in AchE levels in the hippocampus or frontal cortex of treated animals. A decrease in the brain catalase levels was seen in AlCl3-treated animals [Figure 3]a and [Figure 4]a. Administration of olive oil to animals showed significantly improved catalase levels (P < 0.05) in the frontal cortex. On the other hand, canola oil treatment also exerted protective effects toward the catalase levels in both hippocampus (P < 0.01) and frontal cortex. Similarly, rice bran oil administration led to a marked increase in catalase levels in the frontal cortex (P < 0.01) and did not show any improvement in the hippocampus. AlCl3 administration led to a slight increase in nitrate levels in the frontal cortex and significant increase (P < 0.01) in the hippocampus in experimental animals [Figure 3]c and [Figure 4]c. Olive oil administration led to slight decrease in nitrite levels in the hippocampus and significant decrease (P < 0.01) levels in the frontal cortex. On the other hand, both canola oil and rice bran oil showed a significant decrease (P < 0.01) in nitrite levels in the hippocampus and failed to show much change in nitrite levels in the frontal cortex, rice bran oil leading to an increase, on the contrary. AlCl3 treatment led to a significant increase (P < 0.05) in brain lipid peroxidation levels [Figure 3]d and [Figure 4]d. Both olive oil and canola oil demonstrated their protective effect by causing a decrease in brain MDA levels. On the other hand, rice bran oil administration led to a rise in the MDA levels in the frontal cortex, while causing a significant (P < 0.01) decrease in MDA levels in the hippocampus of treated animals. A significant decrease (P < 0.05) in serum glucose level was observed in AlCl3-treated animals as compared to normal control [Figure 5]b. Canola oil and rice bran oil caused a significant improvement in serum glucose levels (P < 0.05; P < 0.01, respectively), while olive oil showed a slight improvement. Both AlCl3 and dietary oils did not show any effect on serum cholesterol [Figure 5]a, triglycerides [Figure 5]c, and HDL [Figure 5]d levels in the treated animals. AD is one of the leading causes of dementia among the world population. Multiple epidemiological studies state that people who consumed higher intake of omega-3 fatty acids in their diet have a lower incidence of AD. To ascertain the neuroprotective effect of dietary supplementation with n-3 fatty acids enriched oils, animals treated with AlCl3 were administered with olive oil, canola oil, and rice bran oil. All the oils used in the present study have considerable content of omega-3 fatty acids, for example, olive oil (about 1.5%), canola oil (about 9%–11%), and rice bran oil (about 2%) [Table 2] for complete fatty acid composition], and are commonly used as a part of diet worldwide. Canola oil is the richest source among these three edible oils (second richest among the plant sources). The animals were fed on a normal pellet diet containing standard ingredients such as wheat flour (22%), Bengal gram flour (60%), groundnut flour (10%), skim milk powder (5%), casein (4%), refined oil (4%), salt mixture with starch (4.8%), vitamins, and choline mixture with starch (0.2%) as per the UFAW guidelines. All comparisons were made with a normal control group and disease control group treated with AlCl3, where animals belonging to both groups were fed with a normal pellet diet without any dietary supplementation. In this study, AlCl3 was utilized for induction of dementia in experimental animals. Aluminum is a known neurotoxin and has been implicated in the pathophysiology various neurological disorders. Aluminum and other metals including zinc, copper, and iron can act as cross-linkers of amyloid β-protein and cause oligomerization, thereby causing neurotoxicity. In addition, AlCl3 administration has been reported to cause dementia in Wistar rats. The present study utilizes spatial memory as a measure of dementia. Spatial memory is a function attributed primarily to the hippocampus and frontal cortex. The MWM apparatus was used to assess this parameter. The process of learning and memory entails acquisition, consolidation, and recall of the learned task. During the acquisition trials, the animals learned how to reach the escape platform and quickly with each passing day. As per previous reports, AlCl3-induced dementia in experimental animals, leading to a characteristic increase in D latency and escape latency, and a decrease in the time spent in D quadrant. These observations indicate significant reduction in the spatial memory in rats. Canola oil, rice bran oil, and olive oil reduced the increase in D latency and escape latency, significantly at the end of the study while showing a significant rise in the time spent in the D quadrant. These results indicate the possible protective effect of omega-3 rich dietary oils toward AlCl3-induced dementia. The cholinergic system plays a pivotal role in the learning and memory process. Increase in AChE activity is seen in patients suffering from AD. Chronic AlCl3 exposure results in increase of AChE levels, which contributes to decreased and damage of cholinergic terminals in the cortex and hippocampus. Our findings are consistent with earlier reports, which also state the cholinotoxic effect of aluminum., In the hippocampus, all three dietary oils showed a slight decrease in AchE levels as compared to disease control. On the other hand, in the frontal cortex, only olive oil and rice bran oil showed protective effect toward cholinergic transmission. Oxidative stress is another important contributing factor to the AD pathophysiological cascade. Oxidative stress causes increased levels of reactive oxygen species, mitochondrial dysfunction, and reduction in the mitochondrial membrane potential which further activates the mitochondrial apoptosis pathways, leading to neuronal death. Several earlier reports highlight the ability of aluminum to cause neuronal damage through extensive oxidative damage to biomolecules such as lipids, proteins, and nucleic acids., In the present study, AlCl3 administration to animals, led to the induction of nitrigenic stress, marked by an increase in brain nitrite content, increased lipid peroxidation, and decreased indigenous antioxidant enzymes like catalase. In the present study, canola oil showed the most increase in catalase levels in brain, with rice bran oil also showing marked improvement. However, our results did not show an improved hippocampal catalase activity with olive oil, which shows protective effect in the frontal cortex. Both olive oil and canola oil showed decrease in lipid peroxidation in brain. However, rice bran oil showed protective effect only in the hippocampus, while leading to a marked increase in lipid peroxidation in the frontal cortex. On the other hand, nitrite levels were slightly decreased upon treatment with olive oil in the hippocampus, while significantly lowered in the frontal cortex. Canola oil also showed protective effect toward nitrigenic stress in the brain. On the other hand, rice bran oil demonstrated protective effect in the hippocampus but failed to show any effect in the frontal cortex. Among serum markers, AlCl3 treatment only showed significantly lowered blood glucose, which is similar to earlier reports, while failing to affect any other parameters measured in the study. All three dietary oils showed increased serum glucose, with respect to disease control, with canola oil and rice bran oil showing a significant increase. Among the three oils taken, we can see that, owing to collective evidence, canola oil shows the most consistent protective effect against AlCl3-induced neuronal damage, marked by improved spatial memory and improved brain antioxidant status. This is in accordance with its omega-3 fatty acid content, which is the highest in the canola oil (among the three oils used). However, the authors cannot negate the other dietary oils used which also showed improvement in spatial memory and therefore there is a need for further long-term studies for a more detailed evaluation of these oils. Future endeavors also warrant detailed histopathological evaluation in experimental models for evaluation of protection against neuronal damage. All the oils showed measurable activity in decreasing the effects of pathophysiological markers present in AlCl3-induced dementia. The study highlights the beneficial effects of three dietary oils on spatial memory in experimental model of AD. We conclude that canola oil shows the most protective effect, indicating that chronic canola oil consumption may decrease the occurrence of AD. The authors are thankful to the Department of Pharmacology, Manipal College of Pharmaceutical Sciences, Manipal Academy of Higher Education, for providing the necessary facilities and infrastructure to carry out the project. Whitehouse PJ, Price DL, Struble RG, Clark AW, Coyle JT, Delon MR, et al. Alzheimer's disease and senile dementia: Loss of neurons in the basal forebrain. Science 1982;215:1237-9. Tayeb HO, Yang HD, Price BH, Tarazi FI. Pharmacotherapies for Alzheimer's disease: Beyond cholinesterase inhibitors. Pharmacol Ther 2012;134:8-25. Boudrault C, Bazinet RP, Ma DW. Experimental models and mechanisms underlying the protective effects of n-3 polyunsaturated fatty acids in Alzheimer's disease. J Nutr Biochem 2009;20:1-0. Jicha GA, Markesbery WR. Omega-3 fatty acids: Potential role in the management of early Alzheimer's disease. Clin Interv Aging 2010;5:45-61. Cole GM, Ma QL, Frautschy SA. Omega-3 fatty acids and dementia. Prostaglandins Leukot Essent Fatty Acids 2009;81:213-21. Domenichiello AF, Chen CT, Trepanier MO, Stavro PM, Bazinet RP. Whole body synthesis rates of DHA from α-linolenic acid are greater than brain DHA accretion and uptake rates in adult rats. J Lipid Res 2014;55:62-74. Gerster H. Can adults adequately convert alpha-linolenic acid (18:3n-3) to eicosapentaenoic acid (20:5n-3) and docosahexaenoic acid (22:6n-3)? Int J Vitam Nutr Res 1998;68:159-73. Morris MC, Evans DA, Bienias JL, Tangney CC, Bennett DA, Wilson RS, et al. Consumption of fish and n-3 fatty acids and risk of incident Alzheimer disease. Arch Neurol 2003;60:940-6. Hubrecht RC, Kirkwood J. The UFAW Handbook on the Care and Management of Laboratory and Other Research Animals. Hoboken: John Wiley & Sons; 2010. Khan KA, Kumar N, Nayak PG, Nampoothiri M, Shenoy RR, Krishnadas N, et al. Impact of caffeic acid on aluminium chloride-induced dementia in rats. J Pharm Pharmacol 2013;65:1745-52. Nandakumaran M, Al-Shammari M, Al-Sarraf H, Al-Dossery M, Al-Sale E. Effect of olive oil administration on some hematologic and metabolic parameters in female rats. Int J Pure App Biosci 2012;2:93-9. Morris R. Developments of a water-maze procedure for studying spatial learning in the rat. J Neurosci Methods 1984;11:47-60. Vorhees CV, Williams MT. Morris water maze: Procedures for assessing spatial and related forms of learning and memory. Nat Protoc 2006;1:848-58. Glowinski J, Iversen LL. Regional studies of catecholamines in the rat brain. I. The disposition of [3H]norepinephrine, [3H]dopamine and [3H]dopa in various regions of the brain. J Neurochem 1966;13:655-69. Konings AW, Drijver EB. Radiation effects on membranes. I. Vitamin E deficiency and lipid peroxidation. Radiat Res 1979;80:494-501. Bredt DS, Snyder SH. Nitric oxide: A physiologic messenger molecule. Annu Rev Biochem 1994;63:175-95. Hénon G, Kemény Z, Recseg K, Zwobada F, Kovari K. Deodorization of vegetable oils. Part I: Modelling the geometrical isomerization of polyunsaturated fatty acids. J Am Oil Chem Soc 1999;76:73-81. Deloncle R, Guillard O. Mechanism of Alzheimer's disease: Arguments for a neurotransmitter-aluminium complex implication. Neurochem Res 1990;15:1239-45. Migaud M, Charlesworth P, Dempster M, Webster LC, Watabe AM, Makhinson M, et al. Enhanced long-term potentiation and impaired learning in mice with mutant postsynaptic density-95 protein. Nature 1998;396:433-9. John J, Nampoothiri M, Kumar N, Mudgal J, Nampurath GK, Chamallamudi MR, et al. Sesamol, a lipid-lowering agent, ameliorates aluminium chloride induced behavioral and biochemical alterations in rats. Pharmacogn Mag 2015;11:327-36. García-Ayllón MS, Riba-Llena I, Serra-Basante C, Alom J, Boopathy R, Sáez-Valero J, et al. Altered levels of acetylcholinesterase in Alzheimer plasma. PLoS One 2010;5:e8701. Platt B, Fiddler G, Riedel G, Henderson Z. Aluminium toxicity in the rat brain: Histochemical and immunocytochemical evidence. Brain Res Bull 2001;55:257-67. Thomas DD, Espey MG, Ridnour LA, Hofseth LJ, Mancardi D, Harris CC, et al. Hypoxic inducible factor 1alpha, extracellular signal-regulated kinase, and p53 are regulated by distinct threshold concentrations of nitric oxide. Proc Natl Acad Sci U S A 2004;101:8894-9. Lakshmi BV, Sudhakar M, Anisha M. Neuroprotective role of hydroalcoholic extract of Vitis vinifera against aluminium-induced oxidative stress in rat brain. Neurotoxicology 2014;41:73-9. Taïr K, Kharoubi O, Taïr OA, Hellal N, Benyettou I, Aoues A. Aluminium-induced acute neurotoxicity in rats: Treatment with aqueous extract of Arthrophytum (Hammada scoparia). J Acute Dis 2016;5:470-82. Dawson TM, Dawson VL. Review: Nitric oxide: Actions and pathological roles. Neuroscientist 1995;1:7-18. Guner YS, Ochoa CJ, Wang J, Zhang X, Steinhauser S, Stephenson L, et al. Peroxynitrite-induced p38 MAPK pro-apoptotic signaling in enterocytes. Biochem Biophys Res Commun 2009;384:221-5. Manal S, Azza H, Eman T. The protective effect of Vitamin E agains t the neurotoxic effect of aluminum cholorid in male albino rat. J Am Sci 2010;6:978-91. Yuan CY, Lee YJ, Hsu GS. Aluminum overload increases oxidative stress in four functional brain areas of neonatal rats. J Biomed Sci 2012;19:51. Niedworok J, Fijałkowski P. Effect of long-term aluminium chloride intoxication on selected biochemical parameters and oxidative – Antioxidative balance in experimental animals. Polish J Environ Stud 2004;13:41-3.